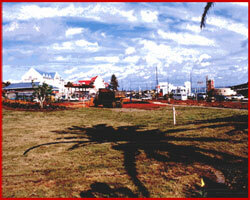 During November 2000 it became apparent to Sun International and SIP Project Managers (Pty) Ltd that the old Humewood Service Station had possibly contaminated the site that the Board Walk Casino was being built on. Real Landscapers discovered a strong smell of fuel / hydrocarbons whilst planting palms. 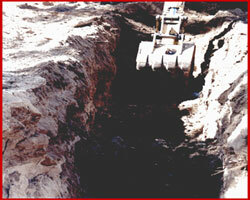 The following day, the site was reported contaminated and trenches had to be dug to assess the situation. During the assessment, the trenches and rock caught alight. It was agreed to remove polluted soil and bedrock and replace with new stockpile top cover. Bioremediation of the site was decided upon as the cost was less and permitted the completion of surface site works on time. This as opposed to the conventional methods of dig, load, dispose of 4000m3, and then import, fill and reinstate 4000m3. This would have taken at least 20 days and been more expensive. 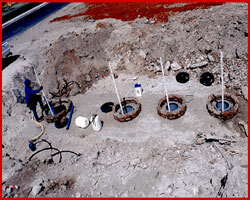 All contaminated water had to be removed and polluted soil bioremediated. A plastic MIC liner was introduced in the trench down to bedrock level to cut off the polluted area from the actual old Humewood Service station site. Establish the source / sources of contamination. Lay a layer of washed stone inside bidim. Place Cordrain pipe on stone. Place feed drip pipe with pressure release valves inside Cordrain pipe. Cover Cordrain pipe with stone. Mix an absorbent, SpillSorb, into and onto the top of the drain system as an absorber of hydrocarbons. Add hay to assist in supplying oxygen and Biodegradation. 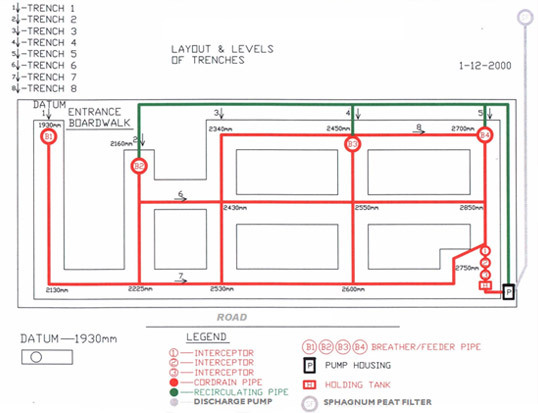 The trenches with Cordrain pipes must be dosed with microbes (imported from the UK) that secrete enzymes and multiply asexually on a regular basis. This will result in millions of microbes / enzymes eating up the Hydrocarbons. More microbes / enzymes nutrients, chelating agents, surfactants and oxi- release nutrients must be fed on a regular basis via the drip pressure pipe. 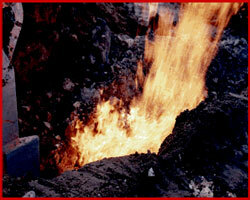 All trenches must be layered with SpillSorb will absorb and encapsulate the Hydrocarbons. This will create a biomass in which the microbes / enzymes will live in and carry on multiplying until the food source (i.e. Hydrocarbons) are depleted. Palm trees must be protected by removing most of the polluted soil and by placing a protective layer of SpillSorb around and under the tree to prevent polluted water from getting to the roots. All the Cordrain pipes must flow to a central point where (3) interceptors / oil traps must be placed. These will be the same as used in any garage or wash bay. They will separate the petrol and diesel from the water and the clean water will flow into a 3600 litre holding tank. The entire system must be on a timer and will circulate creating even distribution of microbes / nutrients etc. plus via circulation increase the oxygen / air supply, thereby enhancing the bioremediation / degrading process. The 3600 litre holding tank is to have a pressure switch which will bleed off automatically and discharge the clean water via pressure through a SpillSorb filter. The filter will remove any traces of Hydrocarbon and any heavy metals. The clean water will then discharge into the sewer. 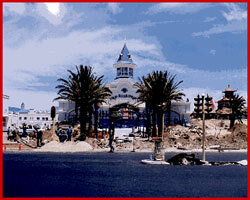 This is the entrance to the Boardwalk Casino. 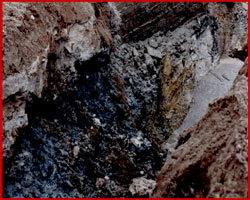 As the trenches are being dug, you can see substantial amounts of pollutants becoming visible. Fires begin to ignite, progressively getting worse and more dangerous. 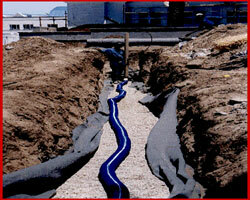 Cordrain pipe is laid on top of stone drainage aggregate with the breather pipe at the far end. 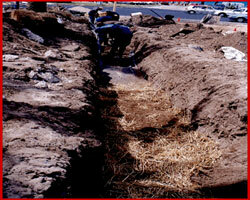 The Cordrain pipe is then covered, and covered again with sand, straw, SpillSorb and then lightly compacted.t. 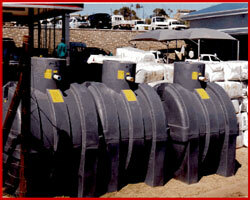 Rockla pipes connect to the interceptor tanks and holding tanks respectively. 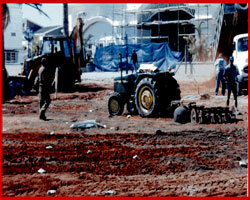 Almost complete, a tractor begins to spread top soil evenly over the once contaminated area. Landscaping nearly complete, breather pipes still to be lowered.